Marvel Universe arrives in Newcastle for the first time! 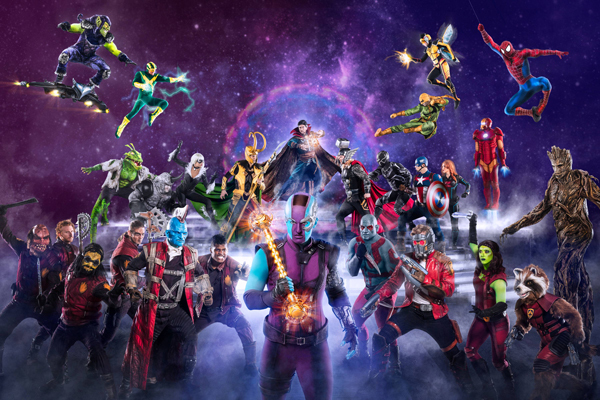 A brand new UK tour featuring Guardians of the Galaxy and more than 20 favourite Marvel super heroes brand new UK tour featuring Guardian of the Galaxy and more than 20 favourite Marvel super heroes and villains! Marvel fans assemble for this action-packed, live arena stunt show! Metro Radio Arena, Thursday 21 – Sunday 24 November 2019. Following a successful first UK tour, Marvel Universe LIVE! makes its Newcastle debut with an all-new storyline and never before seen characters in one epic battle of good versus evil. Super Heroes and villains from the Marvel films and comic books are set to thrill Newcastle audiences for the first time next year when they arrive in the city for a series of spectacular shows. Super Hero action, thrills and drama will soar, smash and burst into The Metro Radio Arena in 2019 as part of a Marvel Universe LIVE! tour. Maarvel Univers LIVE will make its Newcastle debut at the city’s Metro Radio Arena from 21-24 November 2019. The show has already proved a smash hit in the US and audiences will witness cutting-edge special effects, pyrotechnics, and impressive 3D video projection mapping in this completely new thrilling adventure. With aerial stunts, martial arts and daring motorcycle skills, fans of all ages will be immersed in the Marvel universe in a show unlike anything they’ve ever seen before! Called on by Doctor Strange, the Guardians of the Galaxy join Marvel Universe LIVE! on a momentous crusade against the scheming Nebula who teams up with the conniving and loathsome villains Loki and Green Goblin. The incredible superhuman forces of Iron Man, Thor, Black Panther, Hulk and Black Widow will unite in clashes that pit student against mentor, sister against sister and brother against brother. Audiences will be left on the edge of their seats as they witness the outrageous stunts and fight sequences in a truly memorable experience that puts fans at the centre of the action. The show will be flying into Newcastle’s Metro Radio Arena from 21-24 November, 2019. Tickets will go on sale 9.00am Friday 16th November and are available online, from the booking hotline number 0844 493 6666 or 11.00am in person from the Metro Radio Arena Box Office. Please note venue facility and booking fees will apply. Under 14’s must be accompanied by an adult. Under 2’s go free as babes in arms and must sit on parents lap.